HERE WE HAVE ON OFFER A BRAND NEW BC RACING RN SERIES COILOVER SUSPENSION KIT. THIS ITEM IS SUITED FOR THE FOLLOWING VEHICLES. For Street and Circuit Use Front : No Top Mount Rear : No Top Mount Sku : P03. The BR series coilovers use a large 46mm diameter piston in a 53mm diameter damper body to maximise oil capacity. As the damper unit opearates the oil contained within heats up. The viscosity of oil changes as its temperature varies which can lead to changes in the damping characteristic of the unit. BC Racing only use a very high quality oil with their coilovers but go that extra mile to maximise performance and build their BR range with a large 53mm diameter damper body. This increases the capacity of the unit which increases the volume of oil contained which in turn reduces the peak temperature and so significantly improves damper performance. The lower spring platform of the BC Racing coilovers are adjustable. This allows the car to be set up for corner weighting to achieve perfect balance and ensures that maximum tyre efficiency is achieved. The car needs to be placing equal weight on each tyre on an axle so both front tyres need to be taking equal loading as do both rears. This makes sure that both tyres are doing their equal share of work when cornering which increases overall grip, maximises corner speed and reduces lap times. Ride height is determined by the position of the coilover bottom mount. The mount can be wound up and down the damper body to give a full range of adjustment from near standard ride height to so low it wouldnt be drivable on the road. Because ride height is determined by an adjustable bottom mount rather than spring platform you retain full damper travel regardless of the ride height run. BR coilovers feature 30 way damping adjustment that combines both rebound and compression in one adjuster for simplicity and ease of use. This adjustable facility allows you to fine tune the vehicle to meet the relevant conditions. By tweaking front and rear damping you can adjust the way the car handles. Increasing damping force on the rear relative to the front, for example, will start moving the vehicle into a more oversteer orientated stance. If you want to go drag racing in a rear wheel drive car then you want the back of the car to squat off the line to maximise weight transfer to the rear and therefore onto the rear tyres. This maximises traction and helps prevent wheel spin. To achieve this you would soften the rear dampers to allow faster compression. If you had the rear dampers set to hard, as you might run the car on a race track, then the car would be less inclined to squat so traction would be reduced. Conversely, if you want to go drifting and are finding it hard to break traction and are having problems with understeer then making the rear dampers harder will help reduce traction whilst making the front dampers softer will give greater front traction. If its possible to include camber adjustment on your vehicle then the BC Racing coilovers automatically include camber adjustable aluminium pillowball top mounts. These feature the same high quality Japanese manufactured pillowball but give the added benefit of an adjustable top mount that allows camber to be set to suit your needs be it road, track or drift. The damper units are black chromed steel to give superb durability even through the darkest of European winters. The aluminium components (top mounts, locking collars etc) are anodised and the steel lower mounts go through an electrophoretic disposition process followed by powder coating. A random selection of steel components (brackets, dampers, screws etc) are put through a salt spray test once a month to check the quality of the protective processes and that anti corrosive properties are kept at the highest possible standard. They are produced from SAE9254 high strength durable cold wound steel. The springs are compression tested through over 500,000 cycles with less that 5% deformation. Patented concave lower locking collar. Coilovers use a locking collar to prevent the bottom mount becoming loose. This is a very common problem for coilovers in general. BC Racing utilise an innovative and patented designed lower locking collar with a bevelled edge that seats into a corresponding bevel in the coilover bottom mount. This vastly increases the surface area that the locking collar works on and so prevents the common and dangerous problem of the locking collars working loose. BC Racing dampers use a sophisticated shim stack design and high quality oil to consistently control the compression and rebound speed of the damper rod even under the most extreme conditions. As the vehicles travels over rough ground the compression and rebound motion of the damper rod heats the oil. Poor quality dampers use cheap oil whose characteristics alter with varying temperatures. Its vital that high quality oil is used that can maintain consistent viscosity under a wide temperature operating range. BC Racing ensures that only high quality oil is used so that damping rates are maintained not only for the moment in hand i. Whilst out for a back road blast on or track but that long term longevity is maximised with oil that doesnt degrade quickly over time thus extending the dampers operating life significantly. When you work a damper hard on track or on high speed bumpy roads you can cause the oil to aerate and cavitation can occour. This causes foaming which effectively reduces the oils viscosity and so reduces the units damping effect. High quality oil goes a long way to help reduce this problem but BC Racing go one step further and pressurise the dampers with nitrogen. The nitrogen exerts a pressure on a floating piston which in turn exerts a permanent pressure on the oil dramatically reducing aeration and so improving the consistency and quality of the damping. The pressurised nitrogen also adds an additional element of effective spring rate to the damper unit. Bearing mounted upper spring platform. Because the spring twists as it compresses it is very important to minimise stiction between the spring and its seats. If this tension is not relieved then spring binding can occur leading to the spring rate effectively altering slightly as the spring compresses and extends. The tension generated can lead to rapid deterioration of the spring pearches and in extreme cases can cause the spring platform and locking collars to loosen. This can lead to the platform and locking collars walking down the damper resulting in un even ride height and danger of the spring dislocating under full damper extension. The friction between spring and seats also has an effect on steering effort as the springs are physically turned with the wheels. The bearing mounted upper spring platform is one of BC Racings innovative designs. By vastly reducing stiction between the spring and its seats the BC Racing units avoid the above problems thus improving the efficiency of the steering system and allowing the spring and damper to work as designed. Damper adjusting extenders to save you the time and trouble of removing the parcel shelf each time you want to adjust the damping on your BC Racing coilovers we can offer pairs of adjuster extenders. These attach to the adjuster knob on the top of the coilover and are available in three lengths, 110mm, 200mm and 250mm. They attach in seconds with aÂ simple grub screw design. Assister spring perch you might prefer to run some droop with your coilovers or maybe you want to alter the ride by adding an additional smaller assister spring. The spring perch and assister springs allows you to do this. The springs are available in a wide range of spring rates. Number of items listed for sale is a guide only. This item will be in stock in our Sales Office, warehouse or suppliers warehouse in most instances but items listed on e bay is the amount listed available on offer at this special e bay price not specifically the number in stock. We will of course always endeavour to make contact with you should there be any known delay in delivering your item outside the times noted above. We will always deliver in the fastest possible time; we are advising what can happen so as to avoid confusion. Please do not assume we are ignoring you, this is definitely not the case. Again we are not ignoring you, your business is important to us. We want to communicate with you. As long as you appreciate not everything is within our control we will always be able to find a suitable means of resolving any issues. Thank you for your business. 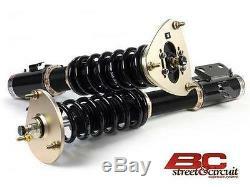 The item "BC Racing BR RN Series Coilover Kit Vauxhall Astra MK4 1998-2004" is in sale since Tuesday, April 09, 2013. This item is in the category "Vehicle Parts & Accessories\Car Tuning & Styling\Performance Suspension\Other Performance Suspension". The seller is "amber-performance-0845.260.0015" and is located in BEDS.